Lance Stephenson became a starter, a key contributor and (for better or for worse) an NBA household name as a member of the Indiana Pacers. He's going to become a rich man, though, as a member of the Charlotte Hornets. The Eastern Conference shake-up that began in earnest last Friday when LeBron James chose to leave the Miami Heat and rejoin the Cleveland Cavaliers continued early Wednesday, as Stephenson and the Hornets agreed to terms on a three-year contract that will pay the gifted and mercurial shooting guard $27 milion. Rick Bonnell of the Charlotte Observer first reported Lance-to-Charlotte, which had been floated as a reasonable potential marriage last month, with rumors of "serious" team interest surfacing last week after Charlotte missed out on restricted free-agent wing target Gordon Hayward. Those reports solidified with Bonnell's Tuesday night update that the Hornets were "now open to the prospect of signing" Stephenson and that "Hornets management had contact with Stephenson’s representatives Tuesday." After an "all-night negotiating session," Stephenson and Charlotte had hammered out a deal that will pay Stephenson $9 million in both the 2014-15 and 2015-16 seasons, with the Hornets holding a team option for '16-'17 that, if picked up, will earn Stephenson "a slight raise" in Year 3. In terms of average annual value, Charlotte's offer slots in at about $200,000 per year higher than the five-year, $44 million deal that Indiana reportedly offered Stephenson at the start of free agency two weeks ago, but the actual difference in contract structure is quite a bit larger. As broken down by the very smart Tim Donahue of Pacers blog 8 Points, 9 Seconds, the five-year Indy offer would have started Stephenson off at "roughly $7.7 million next season, and [paid] a combined $15.9 million in the first two," meaning Charlotte's deal, while smaller in both years and total dollars, guarantees about $2.1 million more up front. In exchange for a higher up-front salary, Stephenson gets a smaller total deal and fewer guaranteed years. The latter, to some degree, represents Stephenson betting on himself — if he continues to build on his breakout 2013-14 campaign, moving from "valuable piece and arguable Eastern Conference All-Star snub" to "All-NBA-caliber two-way difference-maker," he'll be in line for a monstrous third contract, entering unrestricted free agency in the summer of 2016-17 at just 26 years of age, about to enter his athletic prime. "It really wasn't the money. We're betting on Lance and not against Lance," Stephenson's agent, Alberto Ebanks, told Candace D. Buckner of the Indianapolis Star. "So if he had to take a little bit less, he was willing to do that. But you don't want to take a little bit less and play your entire basketball prime, the next five years, for a lower amount of money. If you're going to take less, take less for a less amount of time then hit reset … and enter the free agent market." If Stephenson rolls snake-eyes, though — if his development tails off, and if his on-court and in-locker-room issues don't — he may well wish he'd taken the less immediately lucrative but longer-lived guarantee in Indiana. It's a gamble, to be sure; but then, Lance doesn't seem like the type who lacks for confidence. It's also, given those aforementioned issues, a gamble for Charlotte. As Bonnell notes, the ex-Bobcats haven't made a habit of taking "frequent risks on high-maintenance players," making a somewhat surprising return to the postseason last year after the addition of reputed high-character locker-room guy Al Jefferson (who, happily for Charlotte, also happens to be a nigh-unstoppable low-post scorer) and a roster-wide buy-in to what first-year head coach Steve Clifford was selling on the defensive end. They've now added to that mix a pair of wings who bring some baggage into the locker room along with their estimable talent — rookie P.J. Hairston, whose college career ended on bad terms and whose NBA career began on worse ones, and Stephenson, whose issues with the Pacers pale in comparison to what came before. Hornets owner Michael Jordan and general manager Rich Cho are betting that the character of the veteran holdovers, and the leadership of Clifford, Jefferson and point guard Kemba Walker, will be strong enough to maximize the new talents while minimizing any potential fallout from their integration. For a team whose progression remains tentative, and has really only just begun, it's a risky move, but it's one made for a very simple reason — Stephenson is very good. If he pans out, his addition should propel the "big leap" that Jordan spoke of the Hornets taking after last year's playoff trip, and could turn Charlotte into a viable contender to win its first division title in franchise history. Charlotte's rise from the NBA's basement into the playoffs was predicated, for the most part, on three things. First, there was the putrid state of the Eastern Conference in 2013-14. (For what it's worth, it should be better and more competitive, if not necessarily any stiffer a threat to the West's elite, this season.) Then, there was the addition of Jefferson, who gave the 'Cats an honest-to-goodness offensive centerpiece for the first time in years. Lastly, and certainly not least, there was the Clifford-led overhaul of Charlotte's defense, a sea change dependent on more disciplined floor-balance (improving from 20th among 30 NBA teams in fast-break points allowed in 2012-13 to first last year), a commitment to clearing the defensive glass (29th in defensive rebounding percentage in '12-'13, first last year) and a simplified conservative half-court scheme that looked to cordon pick-and-rolls off to one side of the floor and limit dribble penetration by dropping big men back toward the paint. Stephenson played, and excelled, in a very similar scheme under Frank Vogel in Indiana over the past four years. He won't have quite the same level of defensive talent alongside him — Walker isn't George Hill (although Kemba improved defensively last year), Michael Kidd-Gilchrist isn't Paul George (although he's a pretty damn good stopper in his own right) and neither Jefferson nor Bismack Biyombo is Roy Hibbert (although, to be fair, for long stretches last year, neither was Roy Hibbert). But Charlotte did just fine without that elite talent last season, improving from 30th in points allowed per possession in '12-'13 to No. 6 in the NBA last year, and the 6-foot-5, 230-pound Stephenson should prove a hand-in-glove fit, with the foot speed and lateral quickness to check twos and threes, and, in a pinch, a strong and sturdy enough frame to anchor in the post against even some fours (e.g., picking up the LeBron assignment when George switched over to Dwyane Wade during the Eastern Conference finals). While some Pacers griped about Stephenson "stealing" rebounds last season, he's an elite glass-cleaner on the wing. He grabbed 18.1 percent of available defensive rebounds and 11.4 percent of total rebounds during his floor time last year, which were the best rebounding rates among NBA two-guards last season and would've ranked in the top-15 among small forwards. And while this likely wasn't a primary factor in Charlotte's thinking, removing Stephenson from the Pacers — for whom he made 188 regular- and postseason starts and played 6,405 total minutes over the past two seasons, serving as an integral part of the core starting five that was far and away the league's most-used five-man lineup (and the Pacers' most reliably successful group) over the past two seasons — deals a major blow to one of the Hornets' prospective competitors in the race to dethrone the Miami Heat atop the East now that the King has abdicated his throne. More than what Stephenson's absence means to Indiana, though, the Hornets are banking on his presence offering a jolt of playmaking and daring to an offense that, despite Jefferson's addition, ranked just 24th in points scored per possession last year. His acquisition ought to allay concerns about Charlotte lacking a secondary facilitator after losing the high-post passing of power forward Josh McRoberts to the Heat. He's not an elite shooter, slotting in just below league-average at 35.2 percent last season, but his 3-point accuracy has improved year over year, and his most effective spot beyond the arc — the right corner — could make him a solid pressure-release option when Jefferson draws doubles on one of his frequent forays into the paint from the left block. He's also a very capable ball-handler in the pick-and-roll who can reduce the table-setting burden on Walker, a strong and dynamic finisher at the rim when he drives, and a freight train in transition who might be able to pull the ball off the glass and find an extra couple of points per night for a Charlotte squad that rarely pushed tempo last year, ranking 21st among 30 teams in pace (average number of possessions per game) and 25th in fast-break points scored per game. Importing Stephenson also likely bumps steady-but-unremarkable veteran Gerald Henderson to the bench, which ought to provide a stabilizing force on both ends of the floor for the Hornets' reserve lineups. It could open up some trade opportunities for Cho, too, since Charlotte's wing rotation (Stephenson, Kidd-Gilchrist, Henderson, Hairston, Gary Neal, the returning Jeffery Taylor) now looks a bit crowded. Stephenson can be reckless with the ball, attempting highlight-reel passes when simpler options would suffice and launching into the lane without much of a plan whether on the break or in the half-court; while his assist rate rose as he took on a larger role in the Pacers' offense last year, so did his turnover rate. But the warts in Stephenson's game — the not-quite-knockdown shooting, the looseness on the handle, the overly ambitious decision-making, etc. — are the kinds of things that young players can improve and minimize. For just two years and $18 million guaranteed, with a team option for Year 3 at a comparatively minuscule additional investment of an extra $400,000, this looks like an absolute bargain for the Hornets, who rebounded from losing McRoberts and missing out on Hayward by adding Stephenson and free-agent forward Marvin Williams for less money and fewer years. With the conference in flux and Jefferson's contract up after next season, M.J.'s Hornets have made a big play — not necessarily an all-or-nothing move, given the short-term financial commitment, but a big swing nonetheless — to try to move into the East's upper echelon. We'll see if fortune favors the bold. 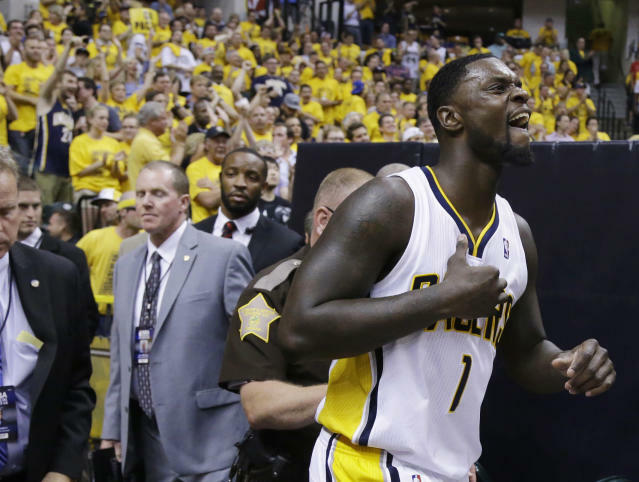 We'll also see how Larry Bird — who had been Stephenson's strongest advocate in Indianapolis, who called Lance "my boy" before the start of free agency, who said he'd "take care of [Lance] – if I can," even after Stephenson's sideshow finish to the season — will bounce back after losing his starting shooting guard despite making a long-term bid at the start of July. "We made him a wonderful offer and they didn't think it was enough," Pacers owner Herb Simon, whose commitment to staying under the luxury-tax line has been clear and unwavering, said Tuesday in Las Vegas, according to Buckner. "So it's a simple situation." On the balance sheet, that may be. On the court, though, it's anything but. Stephenson led the Pacers in rebounds and assists last year, and finished third in points scored. He was arguably their best passer and playmaker, and inarguably one of their best perimeter defenders. He's not as gifted as George on the wing, not as significant a piece of the defensive puzzle as Hibbert at the rim, but he was the hard-nosed live wire that gave the Pacers' league-best defense its edge, and an immensely valuable contributor at a position of scarcity in today's NBA. Those who claim that jettisoning the ear-blowing, technical-earning, rebound-stealing Stephenson represents addition by subtraction will at some point have to account for how to a Pacers team with just $2.5 million in cap room before hitting the tax line and only the recently added C.J. Miles in the mix at the two-guard spot replaces Lance's production. Another move or two could be coming — after agreeing to terms with big men Damjan Rudez, Shayne Whittington and Lavoy Allen to go with incumbents Hibbert, David West, Luis Scola, Ian Mahinmi and Chris Copeland, the Pacers could certainly stand to part with some frontcourt bodies if it'd return a bankable wing piece — but at the moment, Bird and company appear to be dealing from a position of weakness. If they can't figure out a way to fortify the wing rotation, Indiana's best chance of ascending to the top of the conference might have just left the building.